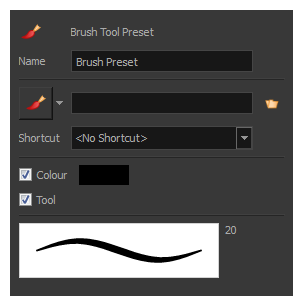 You can create your custom tool presets to quickly access brushes and pencils settings and colours you use frequently. 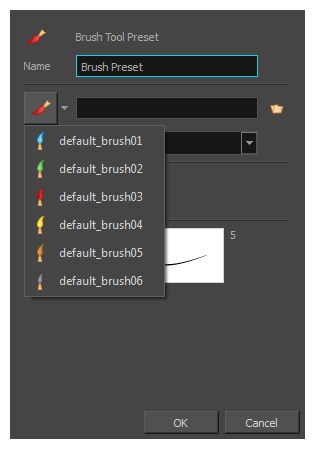 To set a specific colour for your preset, in the Colour view, select the colour swatch to link to the tool. NOTEWhen using a tool preset in a scene that is not using the assigned colour swatch, a colour recovery dialog box appears prompting you to add the colour to the scene. (Optional) From the Shortcut menu, set a keyboard shortcut to quickly access your preset. By default, the shortcuts are unassigned. To assign a keyboard shortcut, select Edit > Preferences > Shortcuts > Tool Presets (Windows/Linux) or Harmony Advanced > Preferences > Shortcuts > Tool Presets (macOS). When you select an option, it will take effect when you use the tool preset. If an option is deselected, then using a tool preset will not override your current settings. Colour: Saves the current colour into the tool preset.